Acclaimed director Wim Wenders brings his visual sensibilities to the Catholic church in his latest documentary endeavor, Pope Francis: A Man of His Word. Wenders takes the viewer on a literal trip around the world with the holy man himself, putting us up close and personal to learn more about the man behind the message. And just as the title suggests, Pope Francis not only says the "radical" things that he says, but he lives his life through actions that reinforce his words and teachings, which prove to be as powerful and important as they are universal. I should say up front that I'm not religious in the slightest, but I thoroughly enjoyed this documentary and the way in which information was presented and arranged. Regardless of your personal affiliation (or lack thereof) to religion, it's tough not to feel the tremendous weight and resonance in the truth of the Pope's message, which defies religion entirely in its modest, humanitarian focus and the respect for science and its findings. As you watch the Pope encounter and interact with people from all over the world as he fields questions concerning lofty topics, such as ecology, consumerism and immigration, he never comes off as anything less than genuine, no matter how heavy handed he can be at times. The result is a heartwarming and illuminating experience that should speak to everyone universally, which is just one of its many affecting charms. Wenders and cinematographer Lisa Rinzler approach the film as artists first and foremost and not so much as a blatant fanatics of the man (although there is a bit of fanaticism too); it feels less like propaganda and more like an intimate hang out session with one of the world's most wise and respected leaders. Wenders and Rinzler put their visual fingerprints all over the film —the best instance being the image projections on the Vatican, which are jaw-dropping gorgeous and profoundly poetic — and the surprisingly effective ways they find to capture the Pope, like in his direct addresses to the camera, where his gaze seems to pierce through the soul of the camera directly into the heart of the viewer. 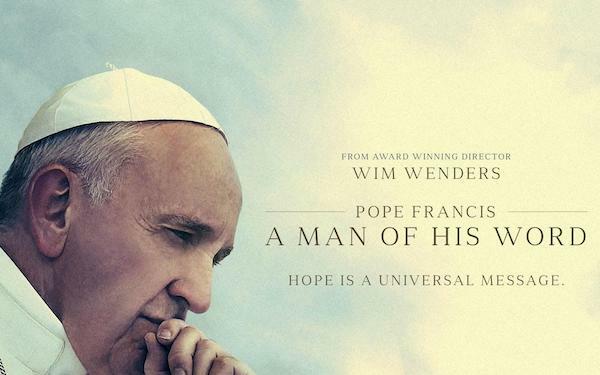 The film isn't perfect, and Wenders' voiceover has a bit to do with that because it only feels necessary when providing the backstory of the original Pope Francis, and it plays a little Herzog-esque as opposed to Wenders doing his own thing. Grievances aside, the film contains a lot of beauty and truth, not all of which is always easy to stomach (like accepting your own mortality), and whatever your personal feelings on Catholicism or the current Pope, I think we can all agree that a man who actively practices what he preaches, especially in a world where most people say one thing and immediately contradict themselves through their next action, is a rare and important thing. I didn't go turning to to the embrace of the church after seeing this one, but I did emerge having more knowledge and deeper appreciation for the man and his mission. If you go in with an open mind, you'll likely come out of this lean and quickly paced film with some newfound wisdom and an uplifted spirit — or at the least some great fodder for conversation. Rating: 4 popemobiles outta 5. What do you think? Was the film profound or just propaganda? We want to know. Share your thoughts and feelings in the comments section below, and as always, remember to viddy well!